I know I should really hold on to one of these 'posts' so I can spread them out a bit.. But if I do that, I will forget to post them and they will be lost in a sea of other photos. So, you all get two different looks in one post. 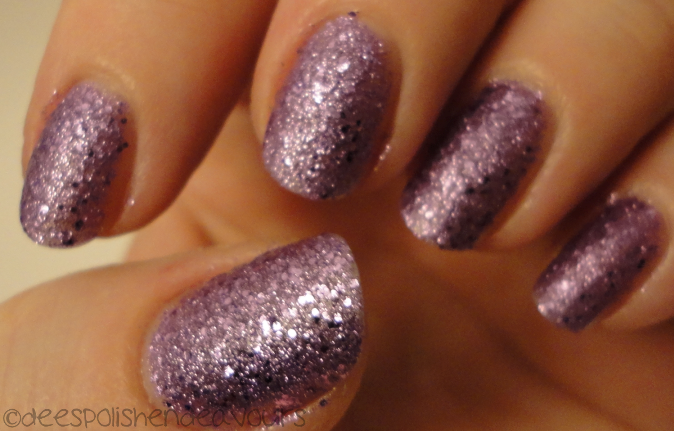 I am going to start with One Less Lonely Glitter, which is in the Nicole by OPI Bieber collection. My sister, her bff and I were out shopping last weekend.. And we stumbled over the Bieber collection.. 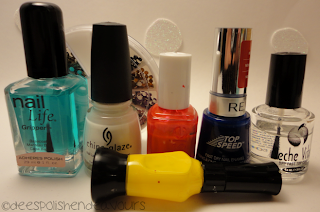 I wasn't overly excited by any of the polishes (don't get me wrong, they are lovely.. but.. I feel like I have a lot of the shades in my collection already..) Then I stumbled upon OLLG and fell in love. But I didn't pick it up that day.. I just kept thinking about it. I ended up back there a couple of days later and snagged a bottle of it! Now, you all know by now that I am not just a swatch kind of person.. Nor am I one to really just wear a polish and be happy. There has to be something else to it.. Although I did love this all on its own. What to do.. Oh right. 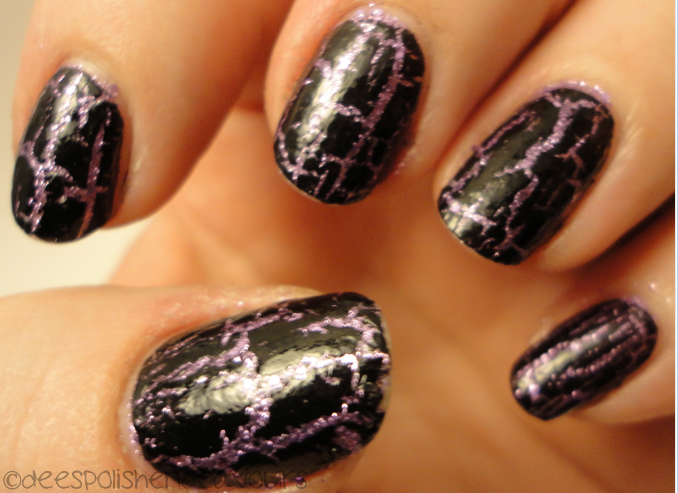 OPI Black Shatter. I wore this for 4 days.. And had some minor chipping going on (see the thumb..) but I really did enjoy this combo. Then, I decided to listen to the ideas of my favourite friend and try nautical nails. 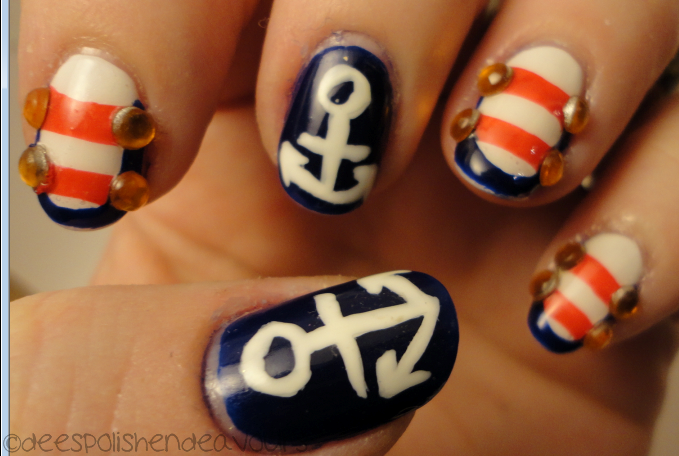 Now, when I think of nautical nails, I think of this POST and how amazing her nails look. Of course it doesn't look as amazing as hers.. But.. I still kind of like them! The only thing I would change is the gems that I used. I think if I used smaller gems, I wouldn't have picked them off so quickly and ruined everything. I did get quite a few compliments on them though. Maybe I will try again some day. I used: CG White Out, Essie Lollipop and Revlon Royal. Also used is my trusty little brush and some gems I received from Born Pretty. Well, that is all for now! I hope everyone had an amazing weekend and has a good start to their week!! ABOP - Thank you - I kind of like it more now looking back on it.. I really like your nautical design :D Love that you included orange in it, I haven't really seen that before I think.. I love the nautical design!